There’s something about left-handers. How often we hear about the elegance of a left-handed batsman, the angled serve of a left-handed tennis player and a left arm bowler’s ‘natural angle’ away from a right-handed batsman. There have been many left-handed players in different sports who have had brilliant careers. These are my selections for the top 5 left-handers in sports. Of course, as with any top-5 list, it is inevitable that some people will disagree with my selections. And as I have considered multiple sports, it’s difficult to actually compare the players. When you talk about the top all-rounder in the world, there really is only one candidate. Everyone will tell you Sir Garry Sobers could bat as well (and as elegantly) as anyone else on the planet. But, he was almost as good with the ball in hand. He debuted for the West Indies as a left-arm orthodox spinner and in his career, he also bowled left-arm chinaman and could bowl pretty fast with the new ball. In addition, he was an excellent fielder. That’s a complete all-rounder for you — world-class batsman, a man extremely proficient in every type of bowling possible to a left-armer and a fantastic fielder. Is there anyone you can compare Sobers to? Absolutely not! Stats don’t usually lie, and just a glance at Sobers’ record is enough to prove that he is the greatest left-hander cricket has ever seen — a whopping 8032 runs from 93 Test matches at an average of 57.78 and a highest score of 365* in addition to 235 wickets with a best of 6/73. Sobers is also known for being the first batsman to hit six sixes in an over, a feat he accomplished while captaining Nottinghamshire in county cricket. Sir Gary was 3-4 players bundled into one and any professional cricket team would give their 3 best players to have him at his best in their side. Winning all four Grand Slams in the same year is as rare as a blue (or even a green) moon. After Don Budge, Laver was the first person to achieve this. And incredibly, he managed it not once, but twice! The first time he won all four majors in the same year was as an amateur in 1962. When the Open Era began in 1968 and professionals were allowed to participate in Grand Slams for the first time, he repeated the feat in 1969. No male player since has managed to win the French, US, Australian Opens and Wimbledon in the same year (though 2 female players – Margaret Court and Steffi Graf have, in 1970 and 1988 respectively). This shows just how outstanding a player Rod Laver was – he achieved something which Borg, McEnroe, Connors, Becker, Edberg, Lendl, Sampras, Federer, Nadal and all the other great players over the decades couldn’t! Laver also won the Professional Grand Slam in 1967 – winning the US Pro, Wembley Pro, French Pro and the Wimbledon Pro. In addition to his 11 grand slam singles titles (and 9 professional majors), the Australian also won 6 men’s doubles and 3 mixed-doubles slams in his illustrious career. Sir Don Bradman himself called Wasim Akram the greatest left-arm bowler ever, and it’s hard to disagree with the Don. There are so many bowlers who either bowl fast but aren’t accurate or are slightly slower, but deadly accurate. Akram didn’t belong to either of these categories. He was fast, could swing the ball both ways and had an almost unplayable inswinging yorker. Add to this his reverse swing and a good bouncer and slower ball and you have a complete fast bowler. His fearsome opening bowling partnership with Waqar Younis in the 1990s and early 2000s is probably as good as any fast bowling partnership before or since. He ended his career with 414 Test Wickets and 502 wickets in ODIs (the second highest number of ODI wickets after Muttiah Muralitharan), 1042 first-class wickets, and a world-record 881 wickets in List A cricket. Akram was also a more than decent batsman. He probably underachieved with 2898 runs at 22.64 in Tests and 3717 runs at 16.52 in ODIs, but managed 3 Test centuries and an outstanding highest test score of 257 not out. (Yes, that’s higher than Sachin Tendulkar’s highest score!). Midway through his career, the Pakistani was diagnosed with diabetes, but still continued to play cricket successfully at the highest level. In recent years, we have seen 3 men absolutely dominate tennis — Federer, Djokovic and Nadal. 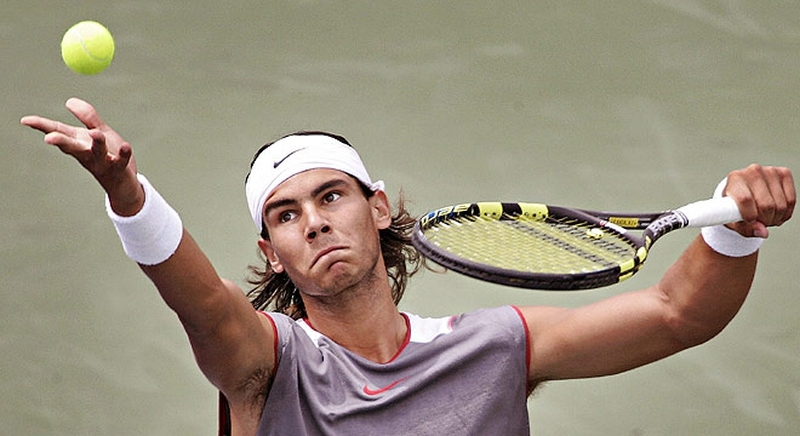 Nadal’s biggest strengths are his amazing defensive skills, tenacity and his vicious forehand. No other player chases down a lost cause as often and as successfully as this Spaniard, who turned 19 during his first Grand Slam win at the French Open in 2005. Since then, ‘Rafa’ has added another 10 Grand Slams and an Olympic Gold (in 2008) to his trophy cabinet (as of October 2012). Nadal has always played a game of patience, hitting shot after shot from the base line, grinding the opponent down. His incredible stamina has won him a lot of points, but has left him injured quite a bit in recent times. Even then, Nadal should have at the very least 4-5 years ahead of him and should be able to win quite a few more Grand Slam titles. Though Nadal was initially seen as a clay-court specialist, he has since improved tremendously in all the other surfaces to win Wimbledon twice, the Australian and US Opens once each and of course, 7 French Opens, thus becoming only the seventh man ever to win a career Grand Slam This is the reason he makes this Top 5 list ahead of greats like John McEnroe and Jimmy Connors. There is no doubt that Lin Dan deserves to be on this list. Ask any badminton player and it is highly probable that he/she will say that this Chinese left-hander is the greatest player ever. Lin has a destructive smash, a deceptive drop shot and an ability to hit outrageous angles. These skills, coupled with his speed on court means that he doesn’t have any appreciable weakness. So, it’s no surprise that ‘Super Dan’ has won every major title possible at the highest level in badminton. Apart from defending his Olympic Gold from 2008 in 2012, he has also won the World Championships, the Asian Games, the All-England Championships, the Asia Championships, the World Cup, the BWF Super Series Masters Finals and the Asian Games. In addition, he has also spearheaded China’s wins in the Thomas and Sudirman Cups. Add more if you think about some new ones on the comment area, or you can just create a new article to illustrate your ideas. Server responsed at: 04/18/2019 11:16 p.m.